After a while one can become a bit blasé about garden views and sea views, so a view of the entire planet from your hotel room is something to get excited about. Russia are leading the space tourism race with Orbital Technologies' announcement they will build, launch and operate the first ever Space Hotel (or the Commercial Space Station to use its correct name). With plans to start welcoming guests in 2016 the hotel will orbit 217 miles above the Earth and can accommodate seven guests in four cabins. Orbital Technologies' CEO Sergei Kostenko, revealed, 'Our planned module inside will not remind you of the International Space Station. A hotel should be comfortable inside, and it will be possible to look at the Earth through large portholes. The hotel will be aimed at wealthy individuals and people working for private companies who want to do research in space'. A crew will be present on board to reheat the meals which will have been prepared on Earth and sent up by rocket. Wash down the microwaved food with iced tea, mineral water and fruit juices. However, you will have to forget about the holiday cocktails as alcohol will be prohibited onboard. The hotel will also serve as an emergency refuge for astronauts should a problem occur aboard the International Space Station. If you wish to join the exclusive club of just over 500 people who have been into space the hotel will be accessible by a two day journey aboard a Soyuz rocket. It should be noted that this is not the first time plans for a space hotel have been announced. 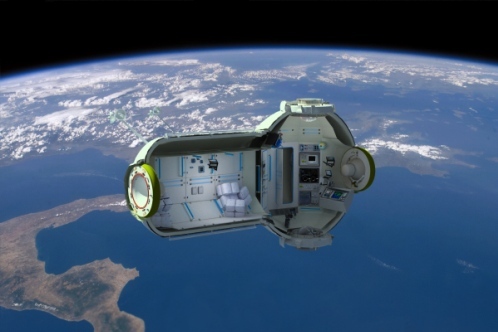 Watch this space for updates on if Orbital Technologies achieve their plans in the race for the World's First Space Hotel.